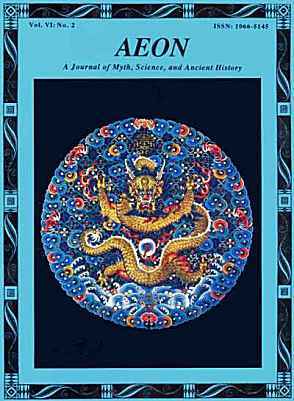 AEON is a journal of myth, science, and ancient history specializing in archaeoastronomy and.comparative mythology. The journal explores the evidence for global catastrophes and interplanetary upheaval in the recent past, seeking out the implications for the affected disciplines. Aeon is designed to encourage independent investigation, to speed up the process of communicating findings to others, and to foster a wider debate as to the interpretation of new data. Why should anyone care about myth? Subscriptions are $40 per year ($55 outside North America) and entitle the subscriber to three book-length issues. For a list of back issues and examples of previously published articles, click on the buttons to the left. Aeon is published about once a year or so. the world's biggest archive of catastrophist literature.